With Bristol it’s difficult to know where to begin. Here is a place with probably the finest architectural legacy of any city in England outside London, a superb location, thrilling townscape, Georgian to Edwardian suburbs of unparalleled delight, a booming economy (well relatively anyway); fortune smiles on Bristol. But it is also a city that is so insouciant or ineffectual about planning and design that it ends up with the monstrous inhumanity of St James Barton, a city where the homeless shelter in the otherwise deserted dystopian pedways of Lewins Mead, a petrolhead junkie of a city where public transport is a joke and noddy housing estates, out of town shopping centres and office parks sprawl to the horizon. The last point is somewhat unfair. Like most big cities Bristol has been unable to establish sensible boundaries and exurban north Bristol is actually ‘South Gloucestershire’. In the 1970s the much hated Avon County was set up to try and define Bristol’s conurbation but this was too large, including places which are clearly not Bristol, like Bath, and even distant Weston-super-Mare. 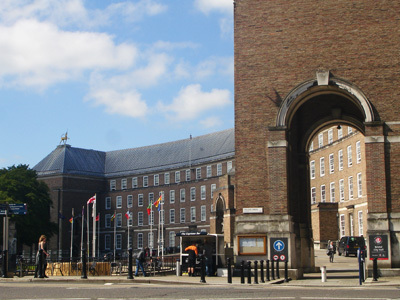 Twenty odd years later another Conservative government abolished Avon and hemmed the City in with suburban councils whose role is essentially to be NOT Bristol. The new ‘partnership’ of local authorities for the conurbation cannot be called Greater Bristol or even Avon; instead it adopts the extraordinarily vague identity of ‘West of England’, locally shortened to WOE. What makes Bristol especially interesting today is that it has elected an architect, George Ferguson, as its mayor on a platform which puts the quality of the environment, transport and urban design top of the agenda - this must be cause for some celebration. The catch is that elected provincial mayors don’t have the power, finance or conurbation-wide role of Boris or American and European models but George Ferguson’s agenda is clear even if his means for implementing this is (deliberately) strewn with procedural and financial difficulties. At least he has a vision and evidently drive and determination which is a good start especially in a city which for too long has been a self satisfied underachiever. 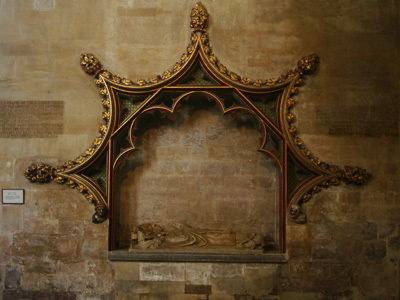 Bristol Byzantine. This should be a cue for an Amsterdam School. Bristol does have quite a lot to be self satisfied about. 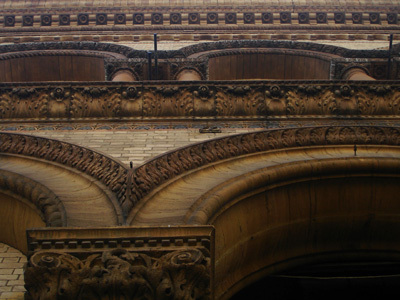 It knows it is a major European city, until the C19th the second city of England. It has an economic confidence as well that structures a different relationship with London from those of the other core cities. It is very definitely a southern city with a dominant bourgeoisie and middle class sense of entitlement – just listen to them braying in the brasseries of Clifton - but is well outside the orbit of London, 120 miles away and 1 hour 40 minutes on the train. 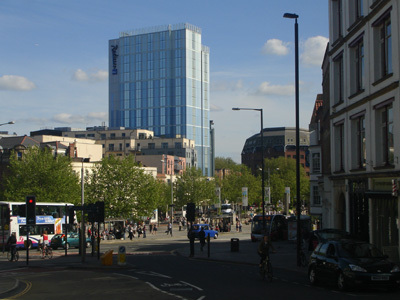 It also has a symbiotic rather than subservient relationship with the capital as metropolitan types, financial companies and civil servants are very much more comfortable about locating here compared with ‘up north’, or worse the Midlands, and thus Bristol has the largest financial and professional services sector outside London. This in turn accounts for much of the appalling new building. When George Ferguson recently referred to Birmingham and Cardiff as 'lesser cities' he was only being honest, if arrogant. John Betjeman famously quipped that Bristol has a railway station like a cathedral and a cathedral like a railway station. Brunel is of course part of the Bristol mystique and Temple Meads is certainly a magnificent station but also something of a disappointment after this build up. 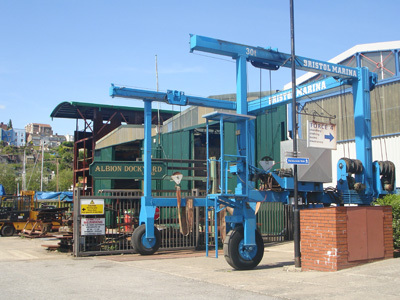 The original Brunel shed with its mock hammer beam roof is now used for private conferences, its later extension similar but plainer is amazingly used only for car parking. Wyatt’s 1878 entrance to the later station is cramped and doesn’t match the grandeur of the curving train sheds, which are actually rather shabby. The long approach is also flanked by lovely Jacobean railway offices but the area is all milling taxis and buses; not much of a sense of grand arrival. 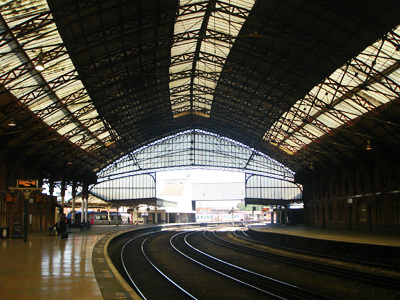 There is some plan to reuse the Brunel shed for London trains when the GWR is eventually electrified, which would be appropriate but a more ambitious approach to improvements and upgrade of the environment as a whole is surely required. This might include using the abandoned Brunel structure for better passenger facilities, which could be quite something. 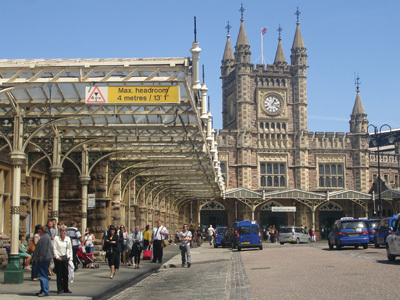 George Ferguson has made improving the approach to the city from Temple Meads a priority but this will not be easy. The inner circuit road (here Temple Gate) is your first hurdle, the Holiday Inn and a derelict petrol station beyond. At least the infamous meccano flyover has been demolished. None of the three roads leading towards the central area look inviting but along Redcliffe Way the spire of St Mary’s Redcliffe beckons. Undoubtedly deserving its reputation as one of the finest churches in England, and more noteworthy than the city’s cathedral, St Mary’s location next to two dual carriageways is unfortunate. The whole area lacks any urban cohesion and the largely redundant Redcliffe Way needs a massive rethink, not just the road but the totality of its urban form. However you soon reach the rather wonderfully chunky 1939 Bascule Bridge across the Floating Harbour where things begin to look up. Along Redcliffe Backs the warehouses and mills rise sheer from the water and make a great ensemble, the sum being much more than the sometimes indifferent modern parts. The best building is the converted WCA warehouse 0f 1909, as Andrew Foyle says in his indispensible Pevsner City Guide ‘a blend of gruff industrialism and Edwardian classicism and an early Bristol use of reinforced concrete frame with brick cladding’. The opposite bank is Welsh Back which still has a working quayside feel. Here you find the best example of the exotic ‘Bristol Byzantine’ style, The Granary of 1869, all very dramatic and almost barbaric in its rearing red brick. However most of the newer infill is very disappointing. On King Street is the famous Llandoger Trow pub of 1664 and the beautiful Theatre Royal of 1766, the oldest surviving theatre in England. Queen Square was Bristol’s first piece of urban planning, laid out in 1699, and is one of the finest in the country although overshadowed by the more unified grandeur of the mansions in Bath’s namesake. It is difficult to imagine now that in the 1930s the dual carriageway Redcliffe Way was driven through the square. 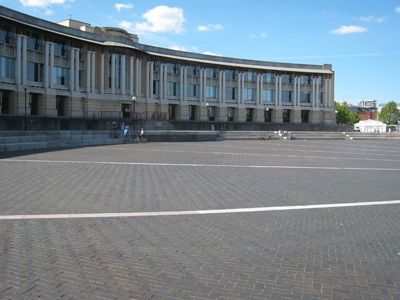 The road was closed and the square imaginatively reinstated in 2000 by the Council’s City Centre Projects and Urban Design Team, which deserves a lot of credit for an excellent job. Redcliffe Way was a self inflicted wound but if you approach from Temple Meads via the initially equally unprepossessing Victoria Street you begin to see the impact of the devastating blitz in 1940/1. 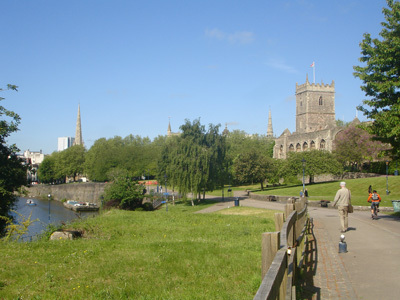 The bombing destroyed much of the old town north of Bristol Bridge, now laid out as Castle Park, and great swathes of inner Bristol. As Andrew Foyle says the physical and psychological effects of the bombing cannot be over emphasised and possibly still informs the apparently passive approach to development today. There is a strong sense of the Bristol that was lost that can never be re-created, which excuses indifference to the pernicious impact on the cityscape of deregulated capitalism over the last 30 years. You can’t blame the Luftwaffe for everything. This is most evident along the third route into the city, Temple Way, a six lane urban catastrophe through a dross-scape of crap offices which Basingstoke would be ashamed of, but this is actually ripping through a real city. The grade separated intersection with Old Market Street is impressively ruthless and the road engineers thoughtfully provide a choice of pedestrian subway or over-bridge across Carmageddon. Neither do the business; the severed Old Market St, which could be Marlborough High St, is now dead as a dodo. What remains of the old commercial centre around Wood the Elder’s Exchange on Corn Street is delightful, full of opulent Georgian and Victorian elevations with Art Nouveau too and some good inter war infill. The post blitz Broadmead shopping streets are generally regarded as a disappointing compromise and certainly lack the vision and clarity of Gibson’s Coventry plan, although by comparison with the 70s glass and thin po-mo of the adjacent Galleries shopping centre, they seem decent and civilised. Broadmead has more recently been ponced up with the Cabot Circus extension by Chapman Taylor, a good piece of planning that draws the streets together in a glazed but open-feeling atrium which does have a strong spatial presence, with lots of walkways and vertical drama. However it is inward looking and although desperately trying to liven up its rear elevations to the inner circuit road (Bond St) only manages to reinforce the barrier. 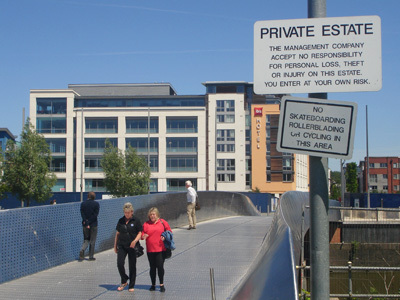 The enterprise is fed by a massive car park right at the end of the M32 – your welcome to Bristol – although the curving glass pedestrian bridge is quite enjoyable. 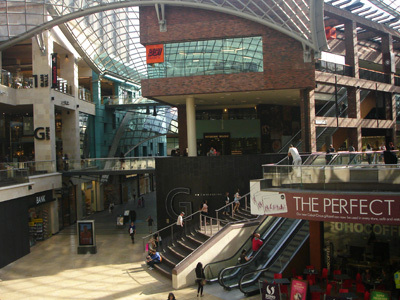 Cabot Circus is in town for out of towners, with the inevitable slightly up market retail and leisure offer, including Jamie’s in a nice conversion nearby. But where is the centre of Bristol? Its spiritual heart is buried under Castle Park, but what Bristolians call The Centre is that awkward space at the interface between the historic districts of Corn Street and Queen Square, the edge of Harbourside, the Cathedral, with Holden’s superb Central Library and Vincent Harris's dull Council House (symbolically renamed ‘City Hall’ by George) and the extraordinary derangement of Lewins Mead. It is not a formal space but an accidental one created by the culverting of the River Frome in 1892 and has never managed to create a convincing urbanity. Most of the buildings around it are small scale, friendly enough, but there are some real shockers especially those commissioned by the Bristol and West Building Society; the 60s tower at the time praised for its elegant simplicity but now apologetically dumbed down and re-clad as a Radisson hotel, and the utterly contemptible 80s red brick polygon with its horribly dominant mansard roof pretending to be unassuming and fooling no-one. Earlier towers like the Colston Centre, 14 stories on a podium, designed in 1961, look light and elegant by comparison. If only Raddisson really did disappear. The Centre has recently been redesigned with much controversy, mostly around the idea that the Frome beneath should be revealed, which would not have left much public space and there is an awful lot of water nearby already at Harbourside. The paving scheme with fountains is a bit cluttered and fussy but seems to work reasonably well. 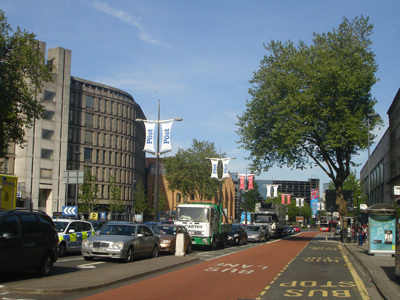 It is a pity there is still traffic on both sides however; despite Queen Square Bristol is timid about challenging the dominance of traffic, something the new mayor really needs to get a grip on. He has made a good symbolic start with ‘car free Sundays’ in the city centre, but why not car free everyday? Lewins Mead leads to St James Barton, the opposite of a maze and rather more like you would imagine the townscape of 1984, although built more than a decade before the prophetic novel was set. 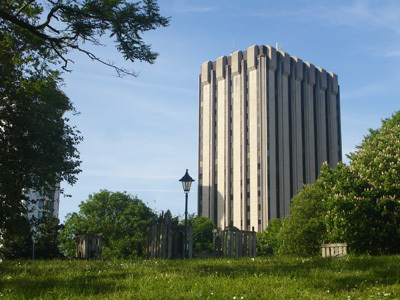 The monolithic blocks with slit windows are relentless, even marching across the street, with further excrescences filling in the picture to either side. Facing them is an unassuming 50s Debenhams, the backside of Broadmead, but actually with a proper façade and entrance. 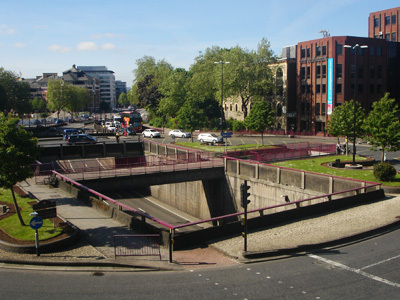 In most cities it could expect maybe a setting of municipal paving and flowerbeds but here it faces barriers and subways under a huge roundabout through sunken landscaping which is about as attractive as you would expect – except that this area (known as the Bearpit) is being reclaimed by a quite lively alternative market, a tribute to the resilience of the human spirit. 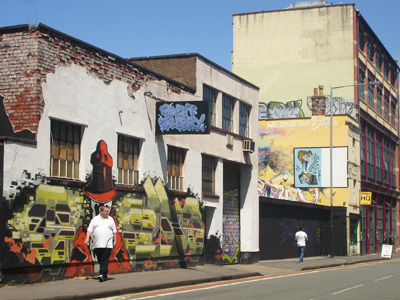 The market is evidently a spillover from Stokes Croft to the north, the epicentre of Bristol’s full on alternative culture, famous for resistance to Tesco, Banksy and that. Still functioning partly as a high street, lots of the buildings are very run down or even derelict, graffiti art is ubiquitous and the atmosphere sort of Haight-Ashbury with a slight vibe of violence. 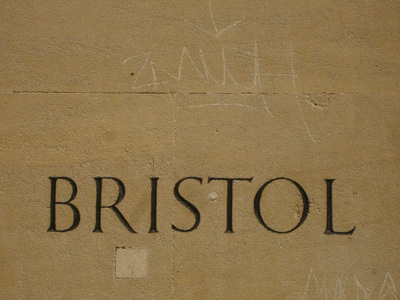 Of course radical politics has a long history in Bristol, notably the 1831 Reform Act riots. If the post war planning and rebuilding of the city centre was timid, the City architects were evidently red-blooded in their approach to housing. The Redcliff Hill flats south of St Mary Redcliffe are a good example, a very pleasant grouping of towers, lower rise flats and some terraces of 1955. In places stone is used for end elevations, presumably an early attempt at contextualism. Waring House, facing the New Cut of the Avon is more monumental with nicely considered scalloped roofline and barrel vaults below. Well planned, it includes a parade of local shops. More ruthless are the Dove Street flats above Stokes Croft, 14 storey slabs which are undoubtedly impressive but, set against the small scale Georgian remnants of what they replaced, you can see why they are not loved. 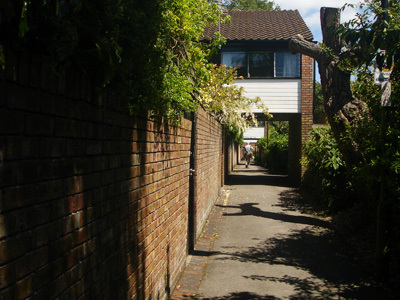 They were completed in 1968, the year a similar scheme for High Kingsdown was abandoned after a national campaign. A new masterplan by Whicheloe Macfarlane is based on Danish example with low rise in pale brick and tile with brick walled gardens and a complex plan around alleyways, so there is an awful lot of brick and tile, and not much landscaping. Sadly the pub which was retained in the middle of the estate is now derelict. 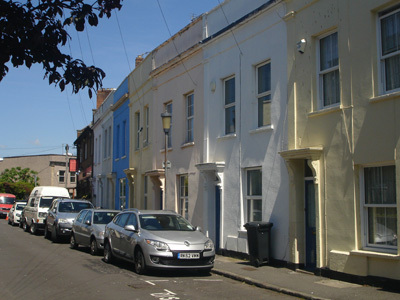 One of the things that distinguishes Bristol is the close relationship of residential areas to the city centre (despite the best efforts of the inner circuit road). Across the muddy New Cut from Waring House you are quickly into the working class district of Bedminster, the main street of which is dominated by the massive Wills Tobacco factories, brick high Victoriana Gothic, extended as Edwardian classicism in terracotta. They are not quite as grand as Seville but very impressive. In the 80s they were converted to offices with an unusual recessed arcade of shops – the price of a whopping Asda to the rear no doubt. There is a striking contrast between this monumentality with the banks and public buildings around and the down at heel modesty of the district’s shopping street where you could be in Coalville or some similar small Midlands town; South Bristol is a very different world. But the colourful stucco terraces of plain Georgian awaiting gentrification are very characteristically Bristolian and with sea gulls squawking it really feels like a maritime city. The docks have moved downstream to Avonmouth and Portbury and they are massive – see them from the M5. 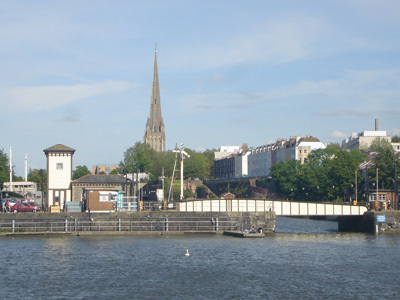 The Floating Harbour, essentially the winding course of the old tidal Avon which was enclosed with dock gates in 1809, is now Harbourside and one of the more successful examples of waterside regeneration. This is not for the new architecture, which is best when modest and mostly very disappointing when attempting to be significant. 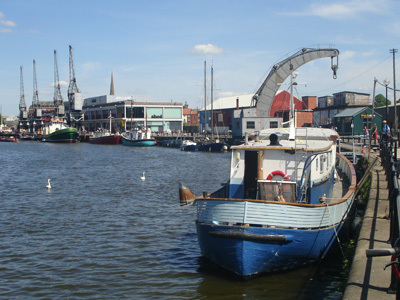 The big advantage is the Floating Harbour itself which is closely enmeshed with the city so the views of the water and of the city beyond are always interesting – Harbourside is part of the place not a place apart. There is a lot of activity on the water, admittedly mostly leisure but does include a useful waterbus service, so the waterspace is always animated, in striking contrast to most waterside regeneration areas. 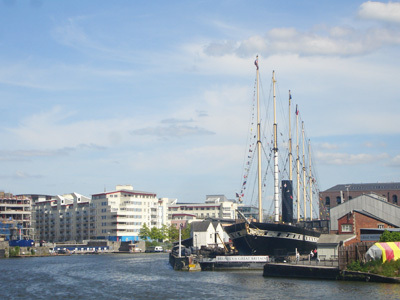 Then there are real attractions, like the SS Great Britain (which looks awfully small for a transatlantic liner), the Arnolfini Arts Centre in an 1830 warehouse converted in 1975, the M shed industrial museum in a 1948 steel framed transit shed with contemporary electric cranes restored and more. 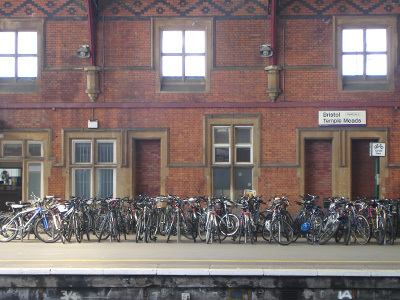 The earlier iron framed sheds of 1890 near the Centre have been converted to the Watershed but this lacks atmosphere as it is mostly chain bars. The heterogeneity of the waterside does something to absorb the various architectural grand gestures, most of which are pretty awful. The worst is Lloyds TSB HQ at Canon’s Marsh designed by Arup 1988, a desiccated Beaux Arts curve enclosing an arid amphitheatre at the confluence of the Avon and Frome channels – a key position which should be full of activity but is utterly lifeless. Wrong, wrong, wrong. 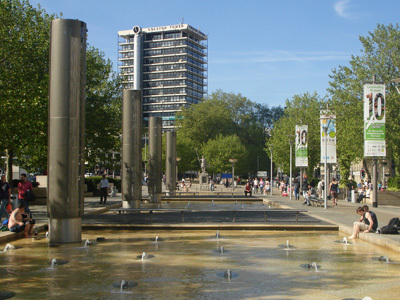 Bristol’s Millennium Square is tucked away behind this, jolly with fountains on a sunny day but not really much of a square, having to rely on what look like exaggerated ventilation stacks from the car park beneath for enclosure on one side and completely lacking enclosure on another. However Explore@Bristol, a conversion of a 1904 concrete goods station by Wilkinson Eyre does the business on the north side. Wildwalk by Michael Hopkins is awkwardly related to the Square and to the adjacent restored former leadworks and does not make much of an impression, externally at least. Cullinan’s Bristol Harbourside residential scheme at Canon’s Marsh certainly makes an impression and a very bad one too. Whereas the character of the Floating Harbour is generally informal, relaxed and modest, Cullinan’s scheme is mega, formalistic, institutional, brash – horrible really but clearly not entirely incompetent which makes it worse. 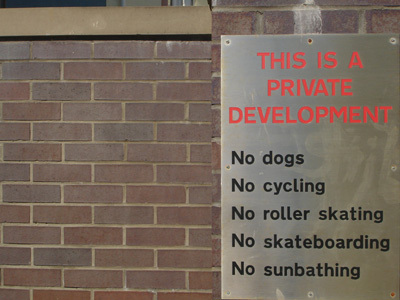 As you would expect the public space is private – loved the ‘no sunbathing’ signs. Across the water Fielden Clegg Bradley wow us with The Point, which is very sharp indeed, a trick which impresses the first time. There are the usual dire residential blocks which could be anywhere and are everywhere but also quite a lot is town houses which are certainly not great architecture but seem to work well with the informality of the place. And there are even boat builders still working here who let you wander through their yards. And all around you the hills and stucco terraces, windsurfers on the water. It is quite seductive. The Floating Harbour even manages to lift Temple Quay, the new office quarter. You might think Bristol needed a new office quarter like a hole in the head, given the massive oversupply from the 70s boom which did so much to disfigure the city, but that is not how regeneration works. The location next to Temple Meads is sensible and the waterside location at least gives it a fighting chance, eye-catching new bridges and all, but the results are mediocre and as for vibrant mixed use, well if you are boycotting Starbucks you can whistle for a coffee. The best building is the vaguely 30ish looking Temple Quay House, home of the Planning Inspectorate. 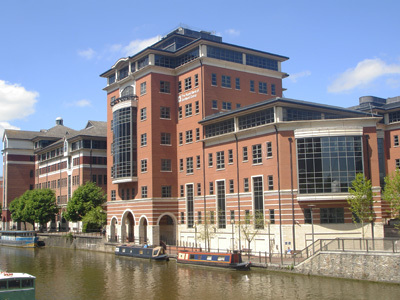 That the planning agency chose Bristol as its HQ says a lot; clearly it was not the quality of architecture that brought it here as its former home was the infamous now demolished Tollgate House. Temple Quay House and Pickles’s Whitehall HQ will be the scene of some high octane battles as the Inspectorate is instructed to overcome the contradictions and obstacles created by the Tory opportunistic folly in opposition of Localism, and its consequences for the Chancellor. Further along the water are the RBS buildings, a dreadful if instructive example of the genre. You can see how there has been an attempt at some sort of proportion and orders, even starting promisingly with the plinth, but then it just becomes too difficult to bother with. In planning it’s the gesture that counts, not the outcome. 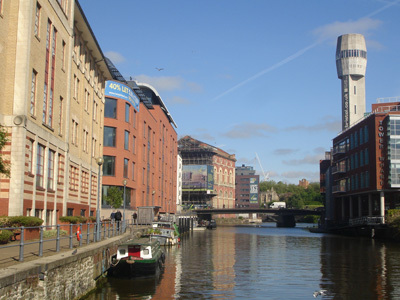 To cheer yourself up continue along the quayside towards St Philip's Bridge to see one of the great icons of Bristol – the Shot Tower of 1968, a pure form in concrete, now disused but incorporated into a residential development. 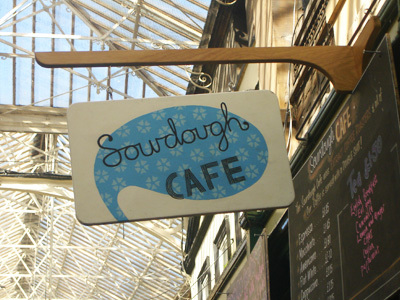 Different worlds collide in Bristol as they do in all cities but here it is more pronounced. This is most evident in Clifton, arguably a different city from Bristol altogether. 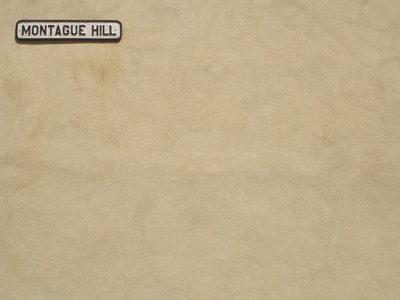 It has no parallels in other English cities, unless you include Brighton. It is not just that it is a lovely inner suburb because most big cities can do that, Leicester or Birmingham for example. Clifton is in a different league because of its sublime picturesqueness, its scale and the confident bourgeois life of its own it exhibits. The position above the Avon Gorge is magnificent even without Brunel’s suspension bridge to emphasise it. 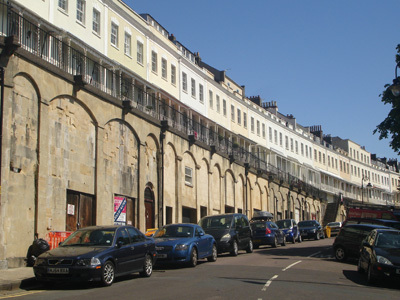 The Regency terraces and villas have that wonderful carefree quirky stylishness which makes Bath look too buttoned up. 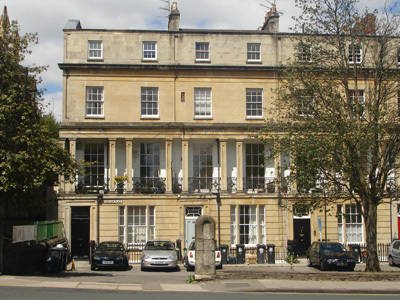 Royal York Crescent is hubristically daring and possibly not that well built, another Regency feature. But Mary Portas has no need to worry about the vitality of its shops and restaurants. I am sure it's possible not to like Clifton but difficult to see how. Victorian Clifton is less sensational and here religion is more in evidence, the two possibly connected. Up Pembroke Road is Clifton Cathedral (Bristol Cathedral at the bottom of Park Street is rather better than John Betjeman suggested). 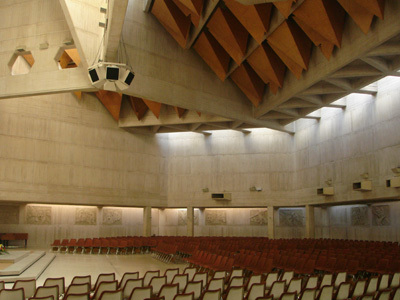 The RC Cathedral, designed by the Percy Thomas Partnership and completed in 1973, is a response to Vatican 2 and its austere interior seems very un-Catholic especially after an eyeful of Napolese Baroque. However the complex hexagonal plan and volumes and the exposed concrete walls illuminated by clever natural lighting are very satisfying, a quiet, contemplative and not at all a show-offish triumph. Further up the road the Anglican All Saints, originally Street but rebuilt after war time damage, is quite the opposite, all emotion and ritual. 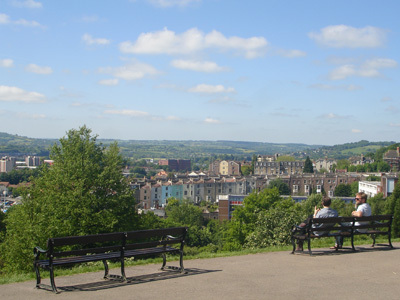 Bristol’s exciting topography is one of its great assets, with very attractive inner city suburbs like Kingsdown and Montpelier on the hills north of the city centre. 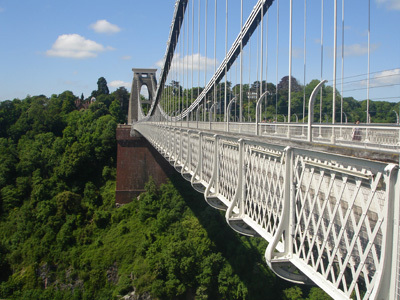 South west across the Clifton Bridge you are immediately into wooded countryside and from Brandon Hill you survey rural Somerset. 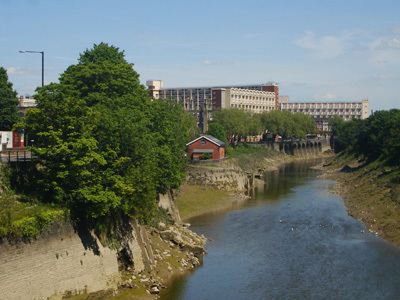 Bristol is not a huge city, the population of the immediate urban area is about 600,000, but it is an uneven city spreading into a much larger but ill defined hinterland of places especially to the north. Its big problem is its transport system. Hugely dependent on the car, it has no convincing strategy for how to tackle this. 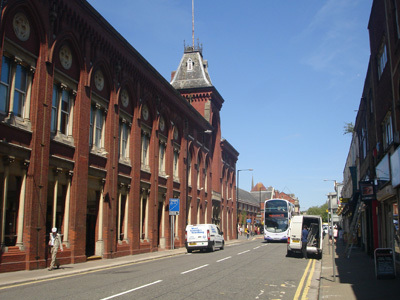 Bristol is the only big city which did not develop municipal tram and bus services and that legacy persists today with very low public transport usage – half that of Nottingham, a similar sized urban area. And whereas Nottingham is extending its tram system, Bristol is …. not sure what to do, which is maybe why George Ferguson was elected. Unfortunately, unlike carpet bagging Boris, he doesn’t have control of public transport. 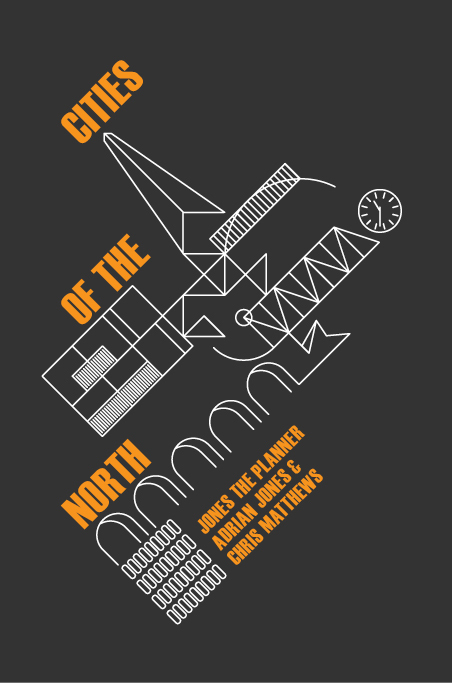 It is ironic that the two big provincial cities that prospered most in the boom years of the financial bubble, Bristol and Leeds, both failed to provide the civic leadership to take advantage of this in terms of creating good architecture and new spaces of urban quality. There was not the vision or the planning framework for this and, despite the cities' good bargaining position, the developers called all the shots, as we can ruefully see today. Now George Ferguson must try and turn this around in austerity, which may be more propitious than boom for the right outcomes. This will require a really bold practical vision and a long term commitment, the two are mutually dependent and self reinforcing. 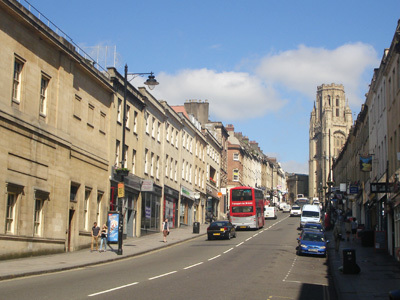 The new vision for Bristol will need to tackle the really destructive legacy of road building and traffic dominance in the city centre and reconnect its fractured parts. So much of Bristol’s post war architecture and planning has been unadventurous and the 1970s office boom was an unmitigated disaster so it really needs to be bold now whilst dealing with things as they are, not being nostalgic for the place it once was. Why not tackle the inner circuit road head on and transform it over time into it a new boulevard to reconnect the city? It could be the route for a new tram linking the suburbs to Temple Meads, the Old Market, Broadmead, Cabot Circus, The Centre and Clifton which would knit the place together and be a catalyst for a real urban renaissance. 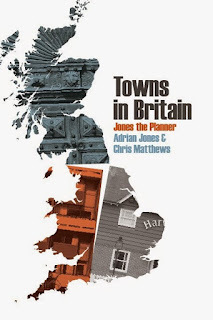 This could be an overarching framework for dealing with problems like the isolation of Temple Meads, the decline of Old Market St, for Broadmead and Cabot Circus to look outwards, to fundamentally rethink St James Barton and to make some sense of Lewins Mead. 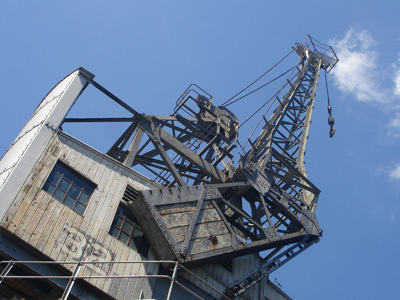 Andrew Foyle in his City Guide says of Bristol that it reveals its charms slowly. Well we fell for it straight away. But Bristol deserves better and now perhaps it may get it..
"It is ironic that the two big provincial cities that prospered most in the boom years of the financial bubble, Bristol and Leeds, both failed to provide the civic leadership to take advantage of this in terms of creating good architecture and new spaces of urban quality. There was not the vision or the planning framework for this and, despite the cities' good bargaining position, the developers called all the shots, as we can ruefully see today". That's how he ends the piece - I've always said that it's Bristol's lack of civic pride and bizarre voting behaviour - almost always "hung", that makes for mediocrity. This has done the rounds at Bristol CC. Head of planning sent it to Transport, Urban Design etc, who then cascaded it down. Just thought you might want to know! "It has no parallels in other English cities, unless you include Brighton. It is not just that it is a lovely inner suburb because most big cities can do that, Leicester or Birmingham for example. Clifton is in a different league because of its sublime picturesqueness, its scale and the confident bourgeois life of its own it exhibits." I disagree with this. Edgbaston in Birmingham is very similar to Clifton (albeit without the 'village' life). Indeed, some of the houses and streets in Edgbaston are actually far grander and more impressive than in Clifton. "“Edgbaston.. one of the two oldest and most distinguished inner suburbs to be found in Britain. Its real but solitary rival is Clifton, climbing up the hill from Bristol. Liverpool, Manchester, Leeds, Newcastle have nothing to compare. 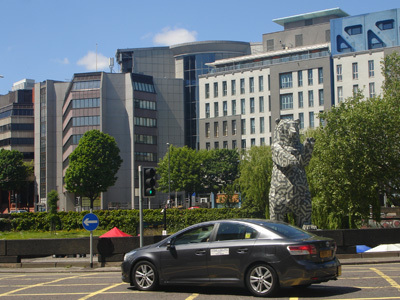 Nor, more surprisingly, do the Scottish cities, for in Edinburgh the New Town is not a suburb and Morningside has little of the Regency and early-Victorian elegance of Edgbaston; and in Glasgow the West End is also somewhat later and lacking the peculiar rus in urbe quality of Edgbaston." Edgbaston's demographics and property prices are also quite similar to Clifton, even if the housing types are quite different. Wow! You managed to talk about Bristol's architecture without mentioning the slave trade. Impressive. I agree with most of this although you clearly like the place a lot and I think it's clouding your judgement in some places. One issue for me is that Bristol doesn't have the legacy of civic and muncipal pride that is evident in the Birminghams and the Manchesters. So no grand town halls, symphony orchestras, historic libraries, etc. This is perhaps why, despite, its history and architecture, it fails to recognise itself as an important city, it's very neighbourhood-focussed, something it shares with London. Your opening gambit about it having the finest architecture in England outside London - I think you could make a strong argumetn for either Liverpool or Newcastle outranking it. I'm also not sure Birmingham is a 'lesser city' whatever Mr Feguson thinks - its economy is significantly larger than Bristol's. 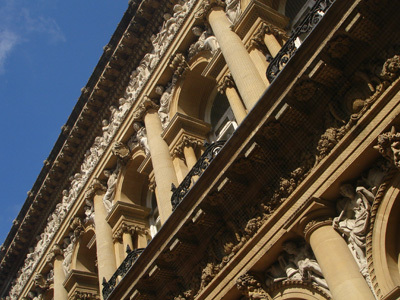 Even with its maritime heritage, Birmingham has had much more of an impact on the world than Bristol over the years, and has had a lot more impact on British political life, from the first great reform act to the Chamberlain family. I agree you can make a strong case for Liverpool or Newcastle having the finest architecture in England outside London but Bristol has the edge for me. I don't know Edgbaston that well but it seems like the best example of a different sort of place to Clifton which is not villagey but metropolitan. And yes Birmingham is a much bigger place than Bristol in every sense other than as an historic town. Edgbaston certainly isn't villagey either! Just in terms of the three areas you mention. In scale it is similar. While it is not quite as pretty it demonstrates a similar wealth of regency architecture, albeit in a villa rather than terrace form. And as for a confident bourgeois life Edgbaston certainly has that as well, on a scale unknown elsewhere in the North or Midlands. For example, it has two of the ten best independent schools in the country, two michelin starred restaurants and the highest concentration of private medical establishments in Britain. It is a different sort of place from Clifton, yes, but in the same way that St John's Wood is a different sort of place from Notting Hill. Obviously the fortunes of their host cities have diverged over recent decades, but Edgbaston maintains its affluence because of the controlling influence of the Calthorpes. 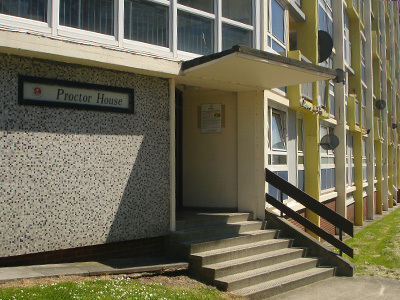 As for Bristol, it has some fantastic domestic architecture and 'town' buildings but it feels quite small scale compared to the cities of the North, and as you say is extremely fragmented and, on occasions, rather illegible. 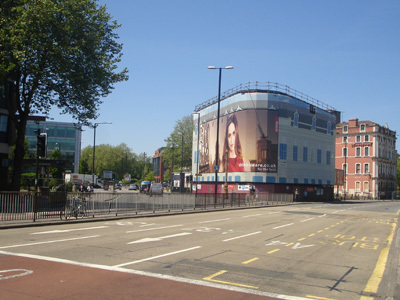 Bristol city centre's townscape would be dwarfed by Glaswegian, Mancunian or Liverpudlian commercial buildings. It feels more like a larger and more prosperous York or Norwich, with a better setting. I think it is easy to mention Liverpool (for example) in the same breath as Hamburg or Chicago. I'm not sure Bristol would withstand the same comparison. 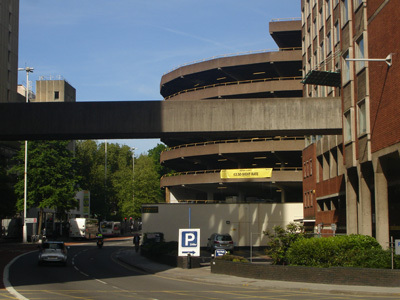 I'd also be interested in hearing a bit more about what happened with Broadmead post-war. As I understand it, from Gavin Stamp's 'Lost Cities', the part of the city centre that survived was demolished to make way for Broadmead whereas the part that was bombed was not rebuilt and left as open space. Is this correct? Brilliant, a hugely enjoyable piece and every point absolutely spot-on, especially Bristol's fear of the motorist and its complacency about its shortcomings as a major city. Glad to hear it's done the rounds in the planning etc departments - it's about time those with some power did something bold about places like old market and st james barton instead of timid tinkering around the edges. A very well argued piece - thank you! You're right about public transport being dire, and unfortunately the next big scheme, Metrobust, is not going to help. Only in transport do we miss Avon County. Bickering between the four local authorities (Bath are OK) about transport has led to a complete absence of any real imagination, and this will hold the area back until it is sorted. As anonymous says, there is a public transport scheme in the works, but unfortunately said scheme (BRT/Metrobus) is little more more than a glorified park and ride. Worse still, the people behind the scheme seem to want to do anything except take road space away from private cars. First they wanted to run a bus route along the wildly popular Bristol-Bath cycle path, then more recently they've proposed sending it along the harbourside (originally it was even going to go in front of the M-Shed and the steam cranes) trashing a newly opened cycle route and taking it across green fields further South of the city. Unfortunately, until we get a proper integrated transport authority, it seems like this is the sort of half-arsed compromise that's going to be foisted on us. A very well-balanced piece, with a real understanding of the qualities - and toe-curling frustyrations - o0f Bristol. Having lived here for the lasst 3 years, I can confirm that it is an exceptionally smug, self-satisfied city - with much to be self-satisfied about as JTP observes, but such smugness is never justified. The public transport issues and the planning mire that engulfs every major civic project are both laughable. And yet it has a huge amount of charm. 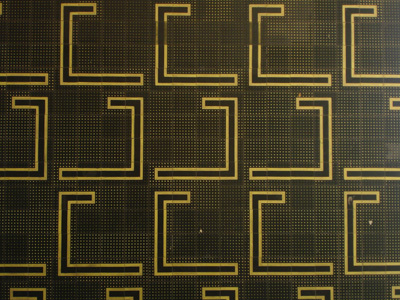 An enigma no doubt, but interesting as all enigmas probably are! Smug? How can a city be smug? Bristol, where I grew up, was a rather dowdy place in the 1970s. Older people still talked about how much better the pre-war shopping centre (buried under Castle Park) was than its 1950s replacement in Broadmead. When I first visited some of the northern industrial cities, the splendid art galleries, theatres, town halls, etc were a revelation. But then Bristol didn't have the huge 19th century wealth that the manufacturing centres like Manchester, Bradford, Glasgow and Liverpool (from the port) had. 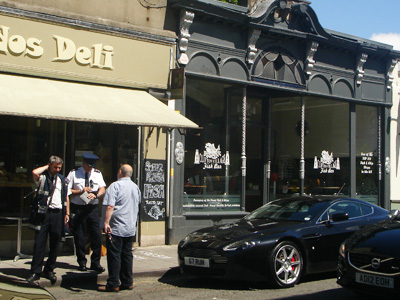 But the late 20th century has been kind to Bristol, with new money from aerospace and finance. And now it shows. Back in the 1950s, much of Clifton was very run down and large houses could be bought for a song. Oh, for a time machine. 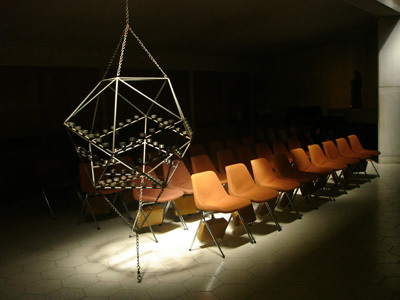 I have only just discovered this blog. Wonderful stuff, even if I don't share your political views. I would love to know what you make of Liverpool and Newcastle, arguably the finest of England's industrial cities. Both have suffered from decades of post-imperial decline which has hindered their reconstruction yet also saved them from the worst of the thoughtless tat that has disfigured so much of Bristol and Leeds.